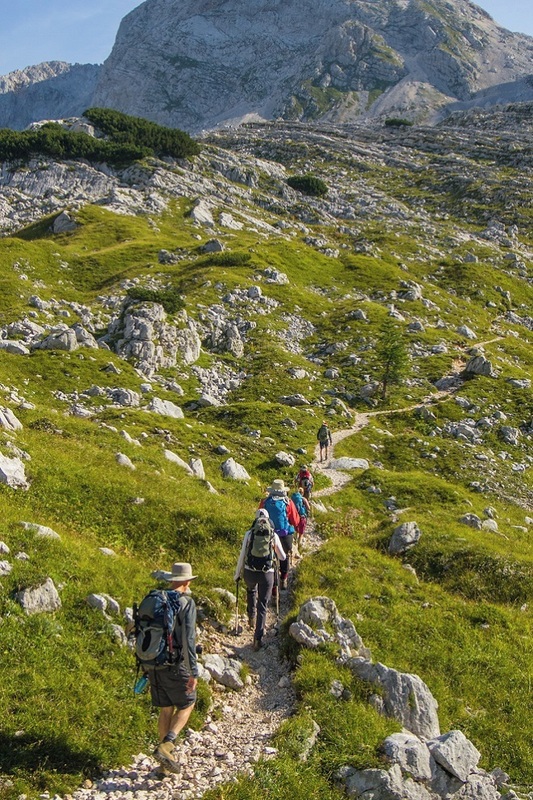 Slovenia, an undiscovered gem and Europe’s best-kept secret with limitless hiking opportunities and friendly locals that amaze with their hospitality. 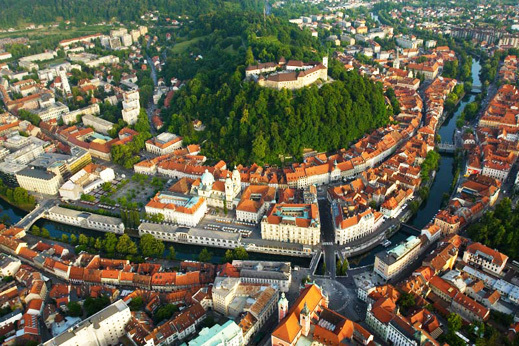 Ljubljana, the capital of Slovenia, traces its roots to the ancient Roman city of Emona and was the European green capital in 2016. It is an oasis of parks and leafy open-air libraries scattered along the bridges and banks of the Ljubljanica River, which snakes lazily through the winding cobblestone streets of the medieval old town and around the hill that lifts its 11th century castle high above the bustling city. 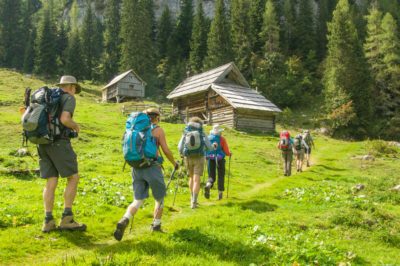 Slovenia Hiking Highlights one can find in the heart of the majestic Julian Alps in the Triglav National Park, which is rich with alpine meadows, grazing cattle, and century-old farms offering homemade shepherd’s cheese and other local delicacies. Enjoyable walking adventures in pristine nature on scenic, safe and well-maintained hiking trails on flat to rolling terrain. Visiting the picture-perfect alpine Lake Bled, which is watched over by a medieval castle perched on the cliff above town. While visiting the lake’s tiny storybook islet and its 12th century church you can make your every wish come true by ringing the bell of wishes. Enjoying the serene glacial waters of the Bohinj Lake, surrounded by lush green scenery and limestone peaks all around. Exploring the charming village of Kranjska Gora, a ski resort only a 10-minute drive from the Italian and Austrian border that hosts many World Cup Alpine Ski races. Slovenia’s most scenic mountain road through Vrsic pass, which offers breathtaking views of snow-topped mountain peaks. The emerald-green Soca River, whose turquoise waters never fail to inspire awe. Once the scene of the legendary WWI Isonzo front that inspired Hemmingway’s A Farewell to Arms, today the river’s pristine waters and beautiful surroundings make it one of Slovenia’s greatest natural treasures. Opt for a dinner at Hisa Franko, the family-run countryside restaurant and inn that is the home of Ana Ros, Slovenia’s best chef, whose appearance in Netflix’s Chef’s Table gained her well-deserved worldwide fame. It’s no accident that she was named the World’s Best Female Chef 2017! The sunny vineyards of Goriska Brda, a region abounding with cherries, peaches, apricots, olives and world-renowned wines, similar to Tuscany but spiced with a dash of Mediterranean flair. Homegrown seasonal vegetables, farm-to-table cuisine, homemade cheese, smoked meat, honey, wine and so much more. Comfortable nights in carefully chosen boutique hotels. Safety and comfort come first, with our versatile and reliable local guides adapting to your pace and fitness level. · Other departures upon request from May to October. Day trip to Postojna or Skocjan caves and Piran on the Adriatic coast. Start your trip in a bustling and charming capital. Arrive to Ljubljana, the cosmopolitan capital of Slovenia (30-minute transfer from airport to the city center). Ljubljana has become one of the most vibrant cities in Europe, with trendy neighborhoods and vintage bicycles swooshing through the old city center, which is reminiscent of Prague. Ljubljana, the 2016 European Green Capital, is a city full of beauty and inspiration, an oasis of lush green parks, open-air libraries, winding cobblestone streets and countless bridges crossing the lazy waters of the Ljubljanica River. Explore the ancient stories of the city in Ljubljana’s 11th century castle and immerse yourself in this unique city. Meet your guide in the afternoon for a trip overview and welcome dinner. 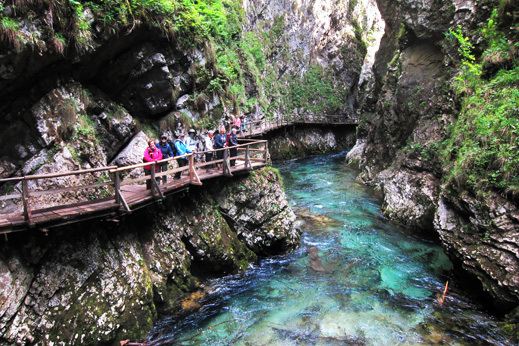 Enchanting walk along the Vintgar gorge. Walk – easy to moderate, 3 hs, 3.6mi (5.4km), altitude gain 430 ft (130 m). 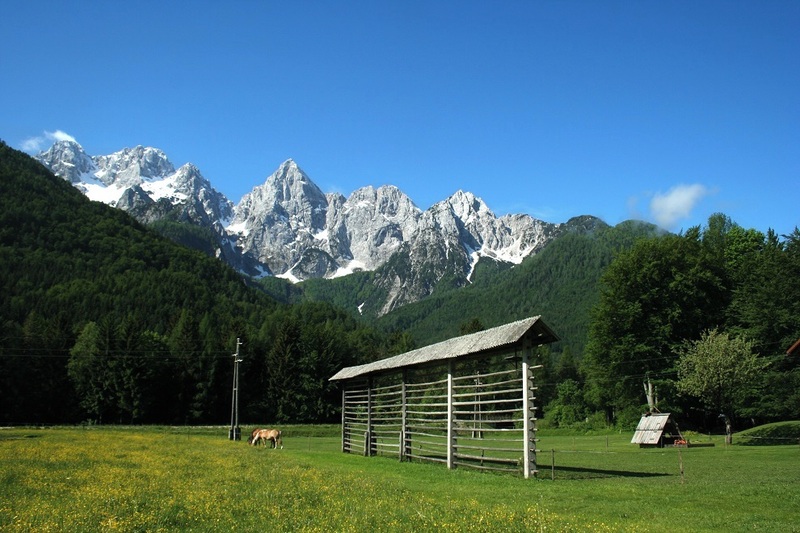 This morning we head towards Blejski Vintgar gorge, first discovered by the locals in 1891. Stroll through this serene gorge on narrow pathways and bridges suspended above the crystal-clear waters of the Radovna River. Its rushing stream slows down occasionally to form little ponds, which are an ideal backdrop to your photographs. On the way back we follow the trails across alpine meadows and pause for a picnic lunch at a spot that lets us take in the views. 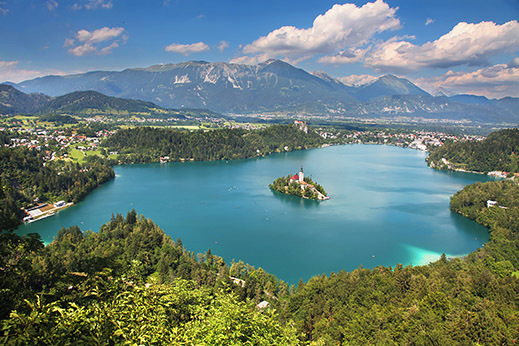 Our next stop is Bled, one of Europe’s most scenic spots. Bled’s picture-perfect setting is centered around the lake, in the middle of which a 12th-century pilgrimage church rises proudly from a tiny storybook islet, guarded by the medieval castle perched high atop the cliffs. We spend the afternoon exploring Lake Bled and enjoying the spectacular views while strolling past Vila Bled, the former residence of Yugoslav president Tito. Our small boutique hotel is filled with antique furniture that reflects its 110-year-long history, but also offers a modern swimming pool and spa area where you can regain your strength. Tonight’s dinner celebrates seasonal delicacies, such as spring asparagus soup and cherry tart or autumn pumpkin soup and chestnut cake. Old Slovenian tradition of making Gingerbread hearts. Slovenia prides itself on having some of the best bread: oven-fresh and filled with seeds, nuts or even dry fruit. It definitely adds to the charm of an already abundant breakfast. The foothills of the Julian Alps set the stage for our next hiking adventure. After a short drive to Bohinj Lake we catch a gondola up to Vogel plateau, which offers magnificent views all around – you’ll be able to see Bohinj Lake, the Julian Alps, the Pokljuka Plateau and Triglav National Park. The latter is known to the locals as the “Kingdom of the Goldenhorn,” the mythical home of Zlatorog (“Goldenhorn”), an ibex buck with golden horns who holds the keys to a golden treasure and lives in these mountains according to local legend. 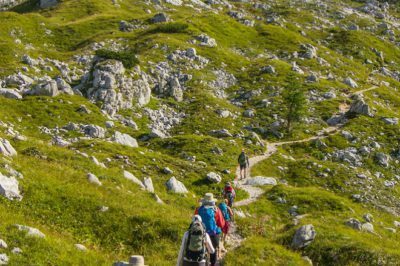 Returning to Bohinj we take a leisurely walk around the lake on an easy accessible forest trail. 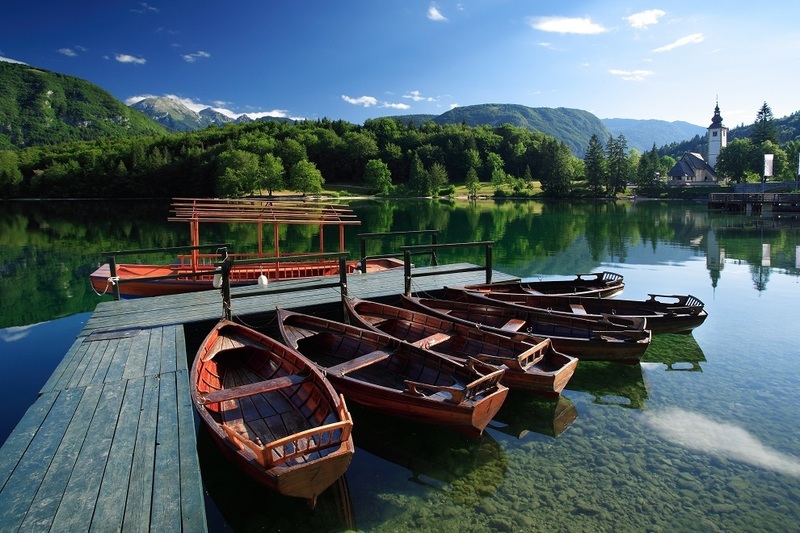 Passing a number of secluded beaches we find the perfect spot to plunge into the refreshing waters of Bohinj Lake. If you want to add a couple more miles to your walk you can explore the gorge of Mostnica River, which is a true natural wonder. The trail leads you close to the riverbank, where you can spot trout swimming in the crystal-clear currents. In the evening we drive to the old town of Radovljica, where medieval houses spin the wheel of history as you stroll down the main street. Visit the Apicultural Museum to learn more about the tradition of bee-keeping, which was established in Slovenia in the 18th century by Anton Jansa and is still practiced today. For dinner we enjoy traditional Slovenian cuisine at Lectar Restaurant, tasting hearty regional dishes that marry the tastes of alpine Slovenia with influences of the former Austro-Hungarian Empire, resulting in dishes such as porcini mushroom soup, sauerkraut and turnip, baked potatoes, pork roast, cheese dumplings and much, much more. 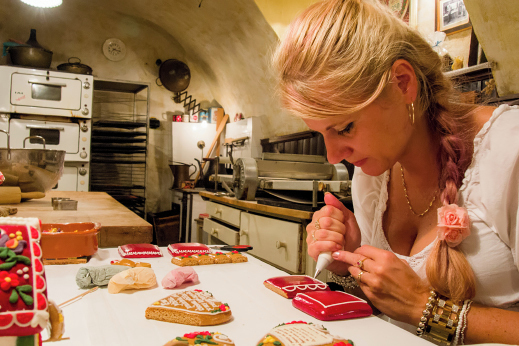 Lectar Restaurant also continues the 200-year-old tradition of making lect hearts – elaborately decorated honey-bread cookies that were once a cherished gift among lovers and remain one of the region’s most recognizable traditional products. This evening will offer a great opportunity to exchange cultural experiences and see how fondly local people still practice their traditional crafts. This morning we make our way along one of the most scenic mountain routes to Vrsic pass (5285ft/1611m), which was originally built by Russian soldiers for military purposes in the early 19th century. We follow an old trade route all the way to the top of the pass, where we stop for some tea and to enjoy the spectacular views. We continue our hike to Sleme where we have a picnic lunch, again surrounded by breathtaking views and also dozens of delicate Alpine flowers, such as the Triglav gentian and Turk’s cap lilies. After lunch we descend towards the village of Kranjska Gora, a ski resort only 10 minutes’ drive from the Italian and Austrian border that hosts many World Cup Alpine Ski races. You can spend the afternoon relaxing at the hotel or go for an easy stroll to the nearby Jasna Lake, whose calm waters reflect the deep colors of the surrounding forest. 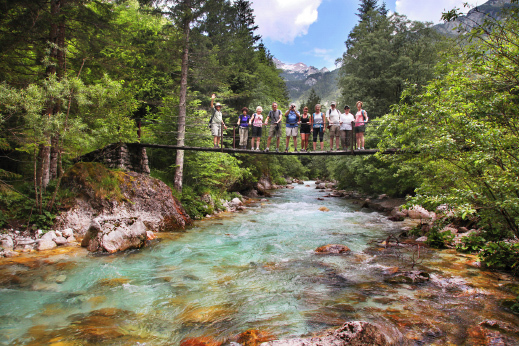 The emerald Soca river is considered to be one of the most beautiful and pure Alpine rivers. In the early morning we drive around the Julian Alps en route to the Soca Valley. From the pass, a series of hairpin turns follow the stream of the untamed Soca River which gives the valley its name. Soca is one of the few unspoiled rivers in the entire European Alpine region and its tumultuous waters even provided the backdrop for some of the most climactic scenes in the second installment of the Chronicles of Narnia movie series. The upper Soca Valley is surrounded by exquisite alpine scenery while the river’s rapids make it a popular playground for kayakers and white-water rafters. This is the westernmost part of Triglav National Park, where Italian and Austro-Hungarian troops fought at the Isonzo Front during World War I, setting the scene for Ernest Hemingway’s novel A Farewell to Arms. We hike the so-called “Soca trail,” following the stream of the river. We finish the day in Bovec, the adventure capital of Slovenia, spending the night in a classy boutique hotel which offers a gourmet dinner. 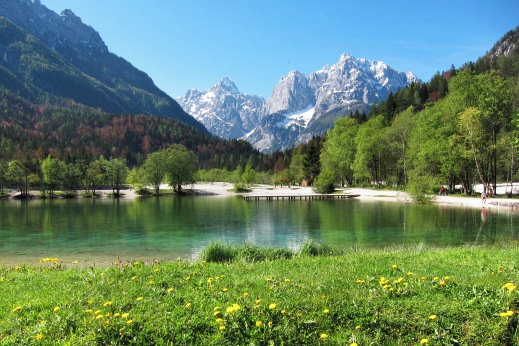 Today’s hike will take you to picturesque views in the heart of Julian Alps. Today we hike to Krn Lake (1394m), situated in the western part of the Julian Alps. 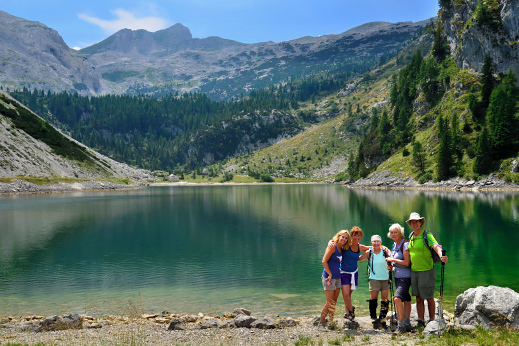 We hike on a trail that was built in the time of the First World War and are rewarded for our efforts by the crystal-clear waters of the lake, views of imposing limestone peaks and the taste of rich local cheeses. Take the afternoon to enjoy the simple but gracious family-run boutique hotel and enjoy a glass of wine on the porch as the setting sun caresses your face. This evening you can opt for some fresh trout from the river, fresh bread and čompe (boiled potatoes with herbal curd). If you’re a foodie you can take the opportunity to taste the gourmet creations of Ana Ros, whose appearance in Netflix’s Chef’s Table gained her well-deserved worldwide fame and placed Slovenian cuisine on the global culinary map. She also received the title of World’s Best Female Chef in 2017! Ana’s philosophy is to use seasonal homegrown and local food, prepared with great attention to detail and spiced with her strong character. While dinner is being prepared we taste some of the best wines that sommelier Valter, Ana’s husband, collects in his wine cellar. It is no surprise that their restaurant, Hisa Franko, was ranked among the top 50 restaurants of the World in 2018! Wine tasting of the indigenous Rebula grape in Brda Wine Country. This morning we embark on a guided tour of the Kobarid Museum, which tells the story of the First World War and vividly depicts the battles of the Isonzo Front that took place in this region. Leaving behind the mountain peaks that kept us company until now, we are now on our way to the picturesque vineyards and rolling hills of Goriska Brda. This hilly region borders the Collio Goriziano region of Italy and resembles Tuscany with a Mediterranean flair. It is justifiably famous for growing the finest fruit and wine in the country. We visit local wine producers to taste some of best world-renowned Slovenian wine, including Cabernet Sauvignon, Merlot and Rebula, the indigenous grape dating back to the 13th century. Sit down to enjoy some mouth-watering farm-to-table food like home-cured prosciutto and other cold meats, a variety of local cheeses, wild asparagus, olives and home-made olive oil, cherry brandy and blackcurrant jam that you simply can’t say no to. 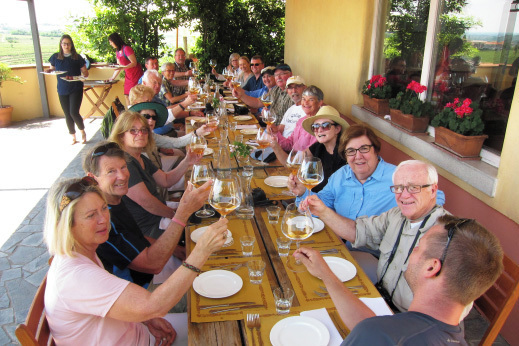 Enjoy the company of your charming hosts, who possess that unique blend of Italian and Slovenian temperament and culture that is unique to the region. 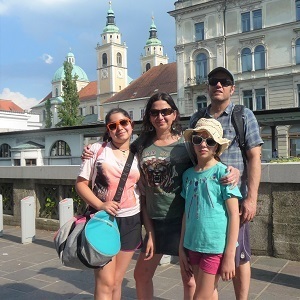 We end the tour by returning to the capital city of Ljubljana, arriving just in time for one last aperitif and an evening stroll by the river. Onward flights should depart no earlier than 7:00 p.m.
price pp dbl occ – varies depending on the size of the group – please contact us for more information. After travelling more than 30 years internationally this trip is right up there! Thank you TrekTrek! When deciding to visit Slovenia for hiking and a diverse cultural experience our research suggested using a company that could meet our needs. We decided to use TrekTrek who managed our expectations with outstanding and very satisfying results. I did not realize the extent of the concierge service we would get. The trip to Slovenia exceeded our expectations. Stasa planned an amazing itinerary - in a short week, we did an amazing hike in Triglav National Park, paddle boarded Lake Bled, wine tasted, rafted the Soca River, went canyoning, had a picnic/swam at a beautiful waterfall in Bovec to name just a FEW highlights. Stasa even took the kids out to pizza and gelato so the adults could have an amazing dining experience at Hisa Franko run by Anna Ros featured on Netflix Chef's Table. Stasa's knowledge and history of the area is remarkable, she was fun, her logistics were impeccable, and was very flexible. The van that carried our crew of 4 adults and three children throughout the trip was spacious,comfortable, and clean. If anyone is considering traveling in this area and in search of a guide, Stasa is a must! I could not imagine anyone delivering a more memorable experience for our families. Being able to see areas and do things we would never have done if we hadn’t been with you. You made our trip very special! Thank you so much for all your hospitality we had such a wonderful time. Slovenia, which we enjoyed so much, is so beautiful and we definately plan to visit again. We will come back to Slovenia. We loved activities and the beautiful scenery. For a family, small hotels or b&b were a very nice option.